As long as I can remember, I’ve used two different names for the exact same bird. The gentle dove, Zanaida macroura, has lived in my mind as both “mourning dove” and “morning dove.” I use the two names interchangeably, without any thought or notice of when I make the switch, or why. It’s fitting, in a way. Mourning and morning are twin sides of the same moment. Mourning almost always precedes a new morning; and no morning dawns without some degree of mourning over what was lost the night before. The aftermath of divorce is like this; light and dark mixed into one, each regenerating the other in a rainbow collection of abiding pain and bittersweet joy. The mind walks the path of the lost relationship from beginning to end, over and over, in search of that moment when a bad decision was made or wrong turn taken. Sometimes you find what you’re looking for: An answer. More often than not, you come up empty handed. In the end, we cannot berate ourselves for decisions made in good faith. Mourning always brings us to this conclusion, though we never quite succeed in accepting it. One of the decisions I made in good faith was to marry a man who did not want to be a father. I didn’t know this at the time I accepted his proposal. It wasn’t until a few years into our marriage, when I felt my biological clock ticking, that the situation became clear. Honestly, I never saw that coming. He was always wonderful with kids, especially with our nieces and nephews. It was easy to imagine him as a father, and it had never once occurred to me he might now want that. The unexpected moment of truth initiated a two-year conversation, including work with a counselor, during which he tried to come to terms with the idea of being a father, while I tried to come to terms with the prospect of never being a mother. I might have, through some other path, ended up not having children anyway. But deep down inside, part of me believes that if I’d married a man who wanted children, I would have almost certainly had them. Of course, there’s the rub: I never met that other mythical man. Of all the men I knew and dated, my ex-husband was hands down the best match I found. I wanted to be with him and no one else. I wanted to enjoy life and grow old with him. When it became clear that choice might mean not having children, I set the dream of children aside in favor of committing my future to the relationship I’d found with him. For years I was at peace with my decision. But then the marriage ended, and now this moment from our journey together has come back to haunt me. I cannot berate myself for decisions made in good faith, but as I mourn the end of my marriage, I find I am also mourning, once again, the loss of the child I never had. I always imagined there would be at least one, and that she would be a daughter; bright and full of laughter. I even had a name for her: Eolyn. When prospects began to dwindle that Eolyn would ever grow in my womb, I began to grow her in my head. I gave her form and beauty, magic and a world of her own. I gave her a forest to grow up in, and since she couldn’t be with her mother, a kind old woman to take care of her. I gave her true love in all its joy and pain. I gave her companions and adventure and suffering and triumph. I gave all of this to her because I had to give it to someone. The creative impulse of my heart simply could not be refused. It’s impossible to know if the Eolyn of my flesh and blood would have been anything like the Eolyn of my stories. But drawing her as I did with pen and paper helped me find a morning inside my mourning. The words I wrote mixed dark with light and sunshine with rain, generating in their turmoil a small but lasting rainbow. I miss the daughter I never knew. I will always love her. 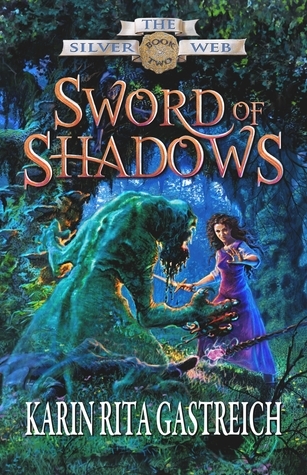 Goodreads giveaways are running simultaneously this week for books two and three of The Silver Web, Sword of Shadows and Daughter of Aithne. Visit Goodreads to enter, or click on the links below. Good luck! Giveaway ends May 01, 2017. Giveaway ends May 15, 2017. Eolyn seemed so real to me I wondered while I read your trilogy if she was an embodiment of someone you knew. How little I knew. Thank you for sharing this with us, Karin. My heart, oh dear. 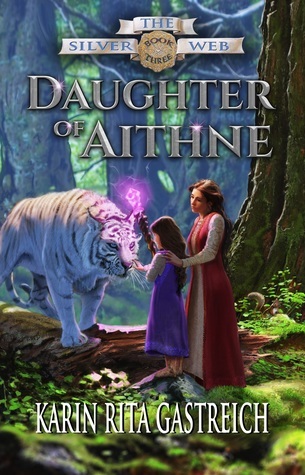 This is so beautiful, and it alters the character, Eolyn, for me. I love her all the more. What a powerful piece. I have known you so long, I could say so much, from the trip with my kids to Venezuela, to working together so often. Now I will only say, I hope you come visit soon! Thank you, Joan! There’s a lot I could say, too. Your support and example has meant so much to me over the years. It’s great to have you & Dave just down the road, again. We’ll definitely do another visit soon.